The microscope users are always fighting with wavelength selection. The optimum optical system will change according to the wavelength. 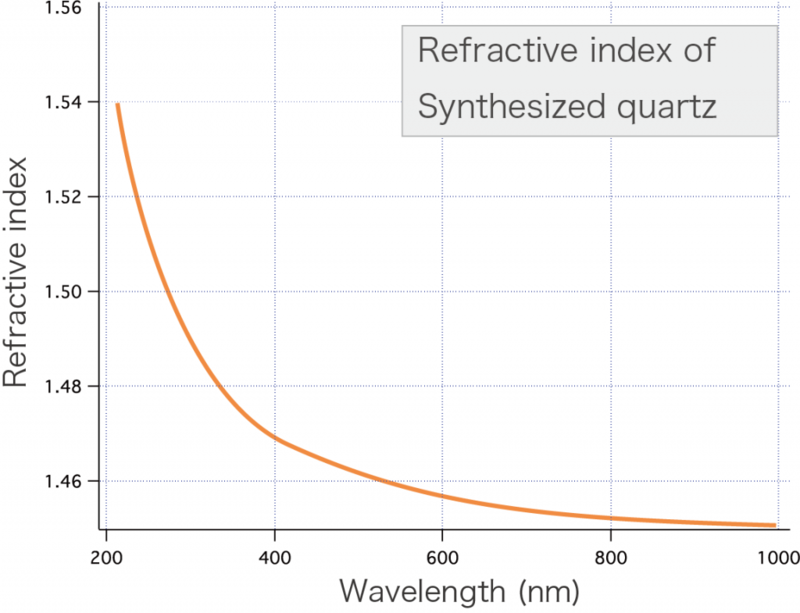 Although Raman microscopes can use various wavelengths as light sources, it has been difficult to maintain performance at all wavelengths so far. This is because the glass used for the optical system shows different characteristics depending on the wavelength. Especially in the ultraviolet region (light shorter than 400 nm wavelength), the characteristic of glass is remarkable. Conventional Raman microscopes have accepted performance deterioration. That is because the advantage of observation in the ultraviolet region is higher than the disadvantage of performance degradation. RAMANtouch vioLa can only benefit from observation in the ultraviolet region. Ultraviolet observation with unprecedented high efficiency and high spatial resolution opens a new world of Raman imaging. Here, we show a part of the optical systems installed in RAMANtouch vioLa. In the typical scanning optical system, the light is diffracted by the lens pair, but in RAMANtouch vioLa, the optical system called catadioptric optical system, the light is reflected and diffracted by the reflecting mirror and the correction lens instead of the lens pair. Thanks to this, we can perform highly accurate scanning even in deep ultraviolet rays. This completely new optical system was the result of the JST Project and was developed by collaborating with Osaka University Kawata Laboratory(LaSIE). Observation with ultraviolet can obtain information that could not be obtained by Raman observation so far. Ultraviolet rays can acquire information only on the surface layer due to the short penetration length (the distance that light can reach) with various substances. In addition, observation avoiding the influence of fluorescence can be realized with high spatial resolution, and wide band gap photoluminescence (PL) can be observed. Surface stress of SiC wafer was measured. Comparing the optical microscopy image with the Raman image, it can be seen that tensile stress is generated in the defective part and that compressive stress is generated between the defects. At the wavelength of 325 nm, only the outermost surface of SiC could be observed. The peak of the Raman shift of 789 cm-1 was used for observation. This peak corresponds to FTO (2/6) E 2 of 6H – SiC. It is observed luminescence from the island structure of InGaN grown on a GaN substrate. The difference in grown methods is imaged as a change of PL emission. Imaging in a wide wavelength range from 325 nm to 500 nm can be performed with a newly designed optical system. In order to realize high N.A. 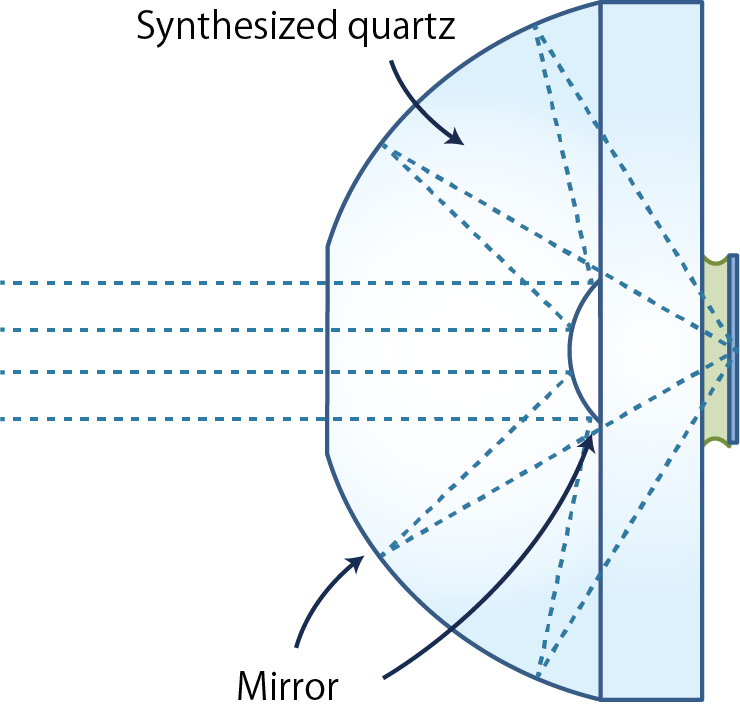 in a wide wavelength range including the deep ultraviolet region, a Schwarzschild reflective optical system filled with synthetic quartz is used. It is a completely new objective lens that realizes both high throughput and high N.A. at the same time. Combined with RAMANtouch vioLa, further high-speed imaging can be performed in deep ultraviolet region.